Researched have tracked the Great White Shark Mary Lee since September 2012. A great white shark, or as a character in "Jaws" would put it, a Carcharodon carcharias, has been spotted off the Jersey Shore. Mary Lee, 16 feet long and 3,456 pounds, was right off the coast of Brigantine north of Atlantic City as of early Friday morning and can be easily tracked after a research group attached a tracking device nearly three years ago. OCEARCH, a nonprofit research organization devoted to the study, safety and tracking of sharks, tagged Mary Lee with the device on Sept. 17, 2012, and since that time, the shark has traveled more than 19,520 miles. Chris Fischer, the founder and expedition leader for OCEARCH, named the shark after his mother. "My parents have done so much. 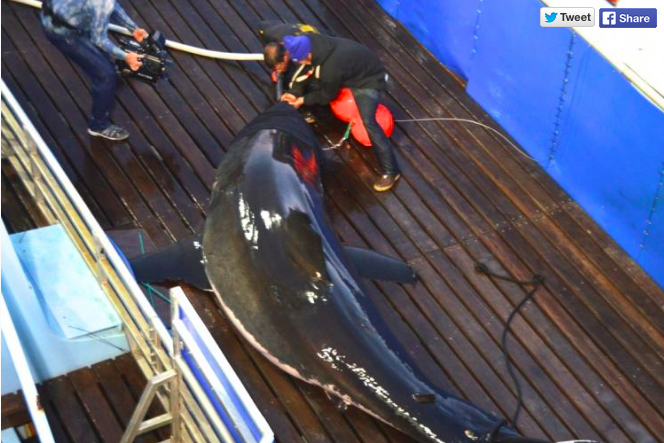 I was waiting and waiting for a special shark to name after her and this is truly the most historic and legendary fish I have ever been a part of and it set the tone for Cape Cod," Fisher said on OCEARCH’s website. Mary Lee has since become a social media star. Michael Brennan President of the Brigantine Chamber of Commerce said he saw the story about the shark on Facebook. "The striped bass are just showing up now. There is food out there,” he said. "That is why the shark is coming up this way. She is following the food." But so far, it seems people are content following Mary Lee from a safe distance and leaving her alone.You can follow Mary Lee’s movements here and donate to OCEARCH’s work here. Capt. Andy Grossman, owner of Riptide Bait and Tackle in Brigantine, said that fishing season has been busy “but I don’t know if [the shark] has been the reason.” He has not seen an uptick in shark bait sales, he said. Phillyvoice staff writer Michael Phillis contributed to this report.